Its all been about colour this past week for me! 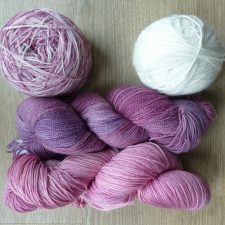 I have been doing an experiment with mordants (the simple mineral chemicals I use to make the natural dyes “stick” to yarn) to see if I could simplify the process. I wanted to make the mordanting Eco-friendly by not using heat and still get a good colour when the yarn is dyed. 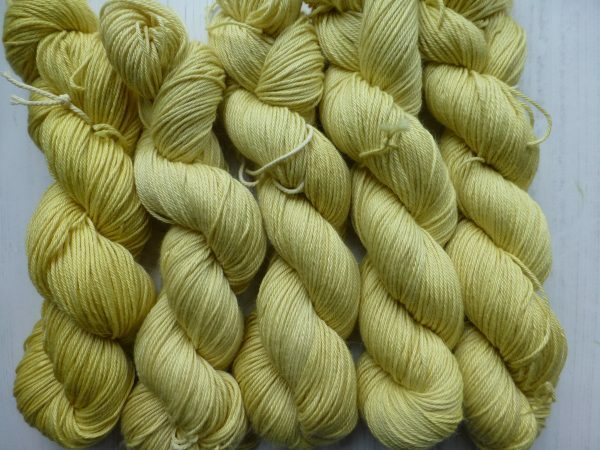 I used a bamboo/silk yarn as silk usually takes colour very well. I mordanted for varying lengths of time with and without heat, and the results were not as I expected at all! I thought the heated mordant skeins would be much darker. There was so little variation in colour intensity on the yarn after dyeing that I don’t think I need to heat the mordants at all. What do you think? The colour of the left skein is slightly darker, but its so little. I have joined a mystery CAL which starts tomorrow. Its to make the “Skimming Stones” shawl, here’s the FB link if you want to join. I wanted to use yarn from my stash; I have a LOT of yarn so selecting 4 colours to make the CAL was surprisingly hard. I ended up with 2 choices, here they are…. I love the pinks but the blue/grey colours are more “skimming stones” somehow. Perhaps I will do 2! I’ll let you know, but what colour would you choose? How is the weather with you? Yes, fairly poor here too! Its mizzly rain and dull, not summery at all. The lanes around here are bursting with greenery and wild flowers, slowly getting soggy, but still beautiful. As soon as the sun comes out, we have promised ourselves a picnic and I like to take our trusty crochet blankets. 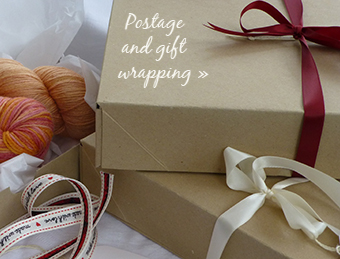 They are bright summery colours, especially the Nurturing Fibres Eco-cotton one I made a few years ago. Why not make a picnic blanket with sunshine colours, ready for when the sun comes out? 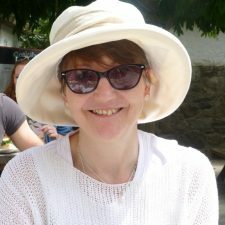 Last week’s blog talks about Nurturing Fibres Eco Cotton and Eco Fusion, have a look here if you haven’t had chance to read it yet….. Look at me in my summer top in the sunshine! Not wearing that today! 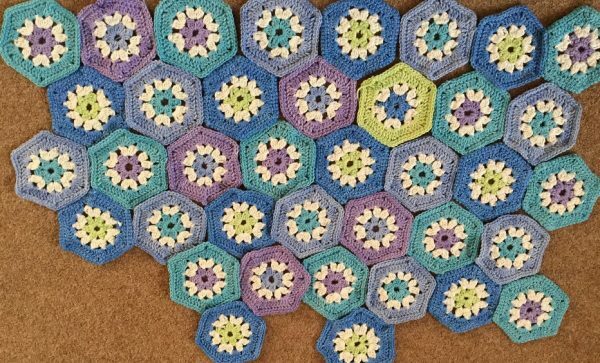 This entry was posted in News and tagged colour, crochet, knitting, Summer, Summer colour. Bookmark the permalink. 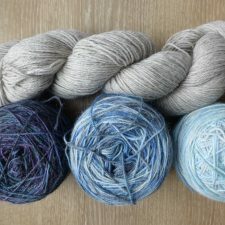 I love the pink, but as you say the blue is more pebbles, I would go blue especially being variegated and not a sold colour go for blue Caroline. ← Summertime, and the knitting is easy!